Amongst many readers there appears to be a kind of sub-conscious prejudice against “genre” books. “Oh, it’s only a romance story” or “It’s not bad…….for a science fiction novel.” It’s almost as if, by forming part of a recognisable category of story, a book is somehow disqualified from being considered as just a “good book”. Some people would even go as far as to conceal their reading of such books or, in some cases, to deny reading them altogether. Now I am not, for a second, claiming that all, or even many, “genre” books count as good literature. One of the reason thrillers or horror stories can form recognisable genres is that there are certain conventions that can easily slip into formula and, being essentially plot-driven, it becomes possible to hide poor characterisation, weak imagery and wooden dialogue behind a clever (or at least flashy) plot. Equally, I am not for a second arguing that disliking “genre” novels is an invalid choice or a lie – indeed I can’t abide romance or horror novels, in general. All I am saying is that a novel shouldn’t be disqualified from consideration as good literature merely by virtue of its subject matter. Tinker, Tailor, Soldier, Spy is a case in point. On its face, it is the tale of how George Smiley, a former senior member of the Circus (le Carré’s proxy for MI6) is brought back secretly to investigate a report from an unreliable agent in the field that there is a Soviet mole high up in the Circus. As he becomes convinced that the report is true, Smiley begins to suspect that the mole was also responsible for the failure of an operation to kidnap a Czech general that ended with the responsible agent, Jim Prideaux, being shot and captured. Prideaux, having been repatriated in a spy swap, reveals that Control, the disgraced former Head of the Circus, had also suspected the existence of a mole and had narrowed it down to four men, the new Head, Percy Alleline and his three closest colleagues, Roy Bland, Bill Haydon and Toby Esterhase. Each of these had been given a nickname from an old children’s rhyme – Tinker, Tailor, Soldier, Poorman. Alleline had risen to prominence in the Circus by his source of intelligence on the Soviet Union, codenamed Merlin. This source has convinced the British that he is able to maintain his cover in Moscow by pretending to feed information to them from a false British mole. Smiley deduces that Karla, the mastermind of Moscow Centre (the proxy for the KGB) has set this up both to discourage the powers at the Circus from hunting for a mole and to act as a cover for the real mole passing real intelligence back to Moscow. In the end, Smiley unmasks the traitor who is murdered before he can be sent to Moscow. 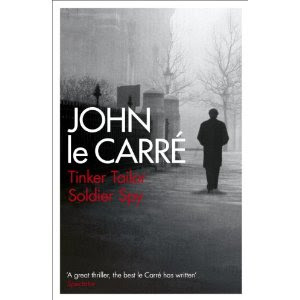 So far, so standard but Tinker, Tailor, Soldier, Spy is far more than “just” a spy novel. The characterisation is rich and detailed. The main characters are not just stereotypical spies and traitors – they have real lives and real emotions. One of the hallmarks of the book is how their private lives affect their feelings and leak into their professional lives from Smiley’s relationship with his promiscuous wife to Peter Guillam’s suspicions and paranoia about his younger girlfriend and Toby Esterhase’s perpetual feeling of being an outsider in Britain. Le Carré uses these characters to explore his central theme of deception. This theme runs through the novel, not just in the obvious sense of the deception of the Circus by Moscow and the traitor but also the betrayal of friendships by the mole and the personal betrayals that several of the main characters experience. In a sense, the hunt for the mole is almost a backdrop or setting for his exploration of trust and betrayal. The imagery of Tinker, Tailor is also wonderful. Written in 1970s, the drabness and gloom of Britain at that time pervades the book and is wonderfully evoked by le Carré. This is not James Bond or Jason Bourne. The world of le Carré’s spies is one of shadows and ambiguities. Their beliefs seem less than solid and, at times, they appear to have more in common with their enemies than with people in the ordinary world. There is no glamour here, no car chases or luxury hotels, just bedsits in Bayswater and run-down safe houses. Tinker, Tailor is the first in a cycle of three novels, known as the Karla Trilogy, which explore the struggle between Smiley and his Soviet rival, Karla. An earlier novel, the Spy Who came in from the Cold was lauded by Time magazine as one of its All-time 100 Novels and has been praised as the best spy novel of all time but, in my opinion, Tinker, Tailor matches it. To call this “just” a spy story is a bit like saying that Lennon and McCartney could knock out a bit of a tune – it really doesn’t tell the whole story. Confession: haven't read a spy novel that really captured my imagination (is it a girl thing I wonder? ).